Australian shooter Catherine Skinner has won a gold medal in the women's trap, defeating New Zealand's Natalie Rooney in the final. The Victorian hit 12 of 15 targets, one more than her opponent in the gold-medal match, and described the win as "surreal". "It's one of those things that you say in the mirror before it all happens going 'yeah it's going to happen, it will!' But at the moment it really happened? It's really hard to describe just how surreal this is," she said. 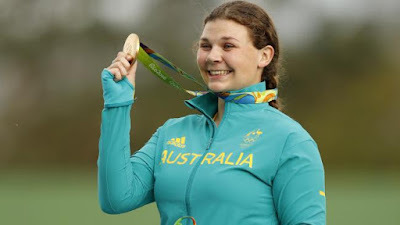 The win makes her Australia's fifth gold medallist in trap shooting and lifts Australia's gold medal tally to three. Skinner, 26, progressed through the semi-final shooting 14 of 15 targets to finalise her place in the final match. American Corey Cogdell, a three-time Olympian, won her second bronze medal by besting Spain's Fatima Galvez in a shoot-off, after each woman shot 13 of their 15 targets for the medal. 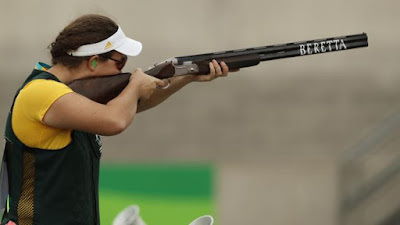 Defending Olympic champion Jessica Rossi of Italy crashed out in the semi-finals after missing five of the 15 targets, a big disappointment for the police officer after she easily claimed gold and set a world record in London 2012. She finished sixth out of six finalists. NO one ever doubted single trap shooter Catherine Skinner’s perseverance, not from the moment she took up the sport on the family farm running Murray Grey cattle. But throughout her meteoric career from the country Victorian town of Mansfield to Melbourne to the gun ranges of the world, she never actually won a major title of note. A bronze at the 2014 world championships, some silver medals at World Cup meets, but actually closing the deal when it mattered? Filling her head with doubts were the epic failures such as Glasgow’s Commonwealth Games, when she crashed from the leading qualifier to miss the medal rounds. So when missed the first shot of her 15-target gold medal shoot-out at Rio’s shooting range, she had that similar sinking feeling. “I probably thought, ‘Oh no, it’s going to happen from there,’ Skinner said. “I have had plenty of finals where I have missed the first shot and it’s gone down hill from there.